The method for creating malleable iron dates back to the 1720s, when French scientist and metallurgist R.A.F. de Re’aumur published the first technical paper on this type of iron. To make it, metallurgists first must make white cast iron. White case iron is a type of very hard but very brittle iron made by melting steel and pig iron together in an air furnace. Pig iron is not pure iron. It is actually a combination of iron ore, charcoal, and limestone melted together under intense pressure. It cools into a high-carbon iron material. The high percentage of carbon makes pig iron brittle, which is why it is not used without being treated further. The white iron castings become malleable iron through a process called annealing. The castings are melted and then kept at a controlled temperature for a set amount of time. They are then allowed to cool very slowly over about 24 hours. Controlled cooling rearranges the chemical structure of the metal, allowing it to retain its toughness without staying brittle. 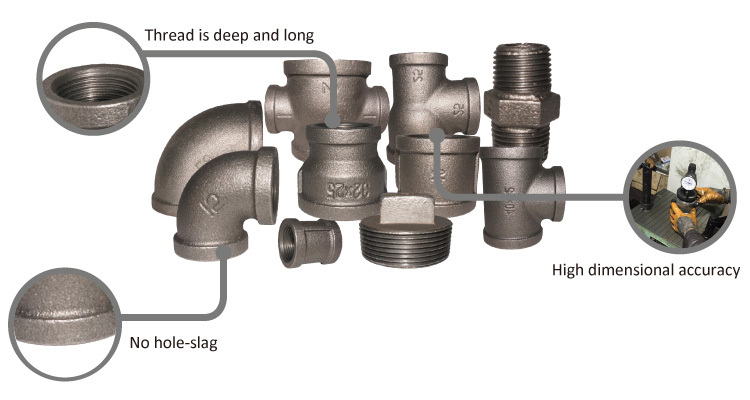 Differences in the speed and temperature of the cooling can result in two different types of malleable iron. Whiteheart iron is lighter in color than blackheart iron. It also differs in chemical composition. Whiteheart has a surface of pure ferrite with a core of pearlite, tempercarbon, and ferrite, whereas blackheart is mostly ferrite. Pearlitic malleable iron is a type of blackheart iron that includes pearlite, which is a mixture of ferrite and cemetite. The International Organization for Standardization has published a grading system for whiteheart and blackheart malleable iron known as ISO 5922-2005. The first character is a letter that tells whether the cast iron is whiteheart, blackheart, or pearlite. The following two numbers list the tensile strength of the iron. Tensile strength is how much a sample can be stretched before it significantly deforms. The last two numbers in the designation list the minimum elongation or ductility of the iron sample.